Home Opinion Citrix Workspace offers the most advanced user experience. Here’s why! Citrix recently announced a major update of Citrix Workspace, the unified vision of how all Citrix products can work together. At first, you may think that there was nothing really new compared to the 2017 announcement where Citrix introduced Citrix Workspace, but it actually has a lot to say about the strategic mindset of the company. Let’s review the new features and discuss why it is the most advanced & integrated Workspace available today. Citrix Workspace is the evolution and convergence of all Citrix products into a unified solution. It is a cloud-only, first-class end-user experience over a unified user interface (UI), allowing users to access any apps, desktops and content from anywhere while only signing in once. Citrix spent time to make sure that all products look the same across all platforms, that they work well together, and offer a seamless experience across devices and locations. To achieve this, Citrix has announced a controversial decision to rebrand all its portfolio in order to bring everything under Workspace. Why is Citrix doing this? Citrix was one of the first to think about unifying products and services under one brand, and started this initiative in 2014 with Citrix Workspace Suite to keep up with the evolution of the end user experience. Citrix was onto something as customers were struggling to maintain and secure many portals and had the need for a unified location. This first attempt was not that great, with a lack of synergy between all the products part of the portfolio. To bring it together, Citrix is moving away from a product-centric company to a solution-oriented company. It is also a response to users wanting to have the choice of devices, cloud providers, etc. Citrix understands the challenges of the cloud transformation. The company was the first to push customers to an all cloud strategy, only to later find out that most customers were not able to move all their applications to the Cloud. They learned from that mistake and are now opting for a different strategy, which consists of giving the customers the choice of transitioning at their own speed. Applications will be delivered from multiple locations. You will have some in the Cloud from different providers. Some apps will not make the transition to the Cloud and will stay on-premises, some apps are already SaaS apps and need to be integrated within the same interface and with single sign-on. The new concept is any apps, any locations, any devices on any network. And they called it Citrix Workspace. The vision of Citrix Workspace is to bring all apps (SaaS, Virtual, Mobile, Linux/Windows), content (On-Prem, Cloud), and devices (PC/Mobile, IOT) together in a single cloud-based interface. This also includes resources that are not Citrix resources. During Synergy 2018, Citrix also announced Citrix Workspace App, the successor of Citrix Receiver for all platforms (web, desktop and mobile) and all applications. This application is the place to get your job done and the key component of Citrix Workspace, replacing many products from the portfolio. Citrix has integrated StoreFront (Cloud), Receiver, ShareFile and Secure Hub into Citrix Workspace to create the ultimate context-based end user solution. All of these products have now fully became part of Citrix Workspace by either being renamed or by being integrated. Citrix Workspace UI development started way back with the Green Bubble Self Service Store Experience, which offered only Windows applications for desktop users. Citrix understood that the market was evolving and Receiver X1 was released to provide a consistent experience across web and desktops for Windows apps. It was an acclaimed release at the time, but quickly customers wanted more than just Windows apps and desktops. They wanted to have virtual apps, virtual desktop, SaaS apps, web apps, mobile apps and content within the same interface and accessible from all devices we have in our life nowadays. The Workspace App (available on web, mobile and desktop) is built on top of Receiver core to provide a consistent user-experience. All Receiver features available today are still supported and no regression is to be noted. Let’s take a look at this app! The header at the top includes the company logo, the search bar and the name of the user logged in. On the left, you have the main navigation pane. The list of apps, desktops and files with specific fonctionnalites related to ShareFile. The main content area is divided by Apps, Desktops and Files with Recent and Favorites options regardless where used. Also available are Collections of applications from differents platforms (Cloud, On-Premises, SaaS) to make them available on the user home page and interconnected. Collections can be considered as predefined filters for users to find related applications quickly. Citrix Workspace app renders the interface based on your platform, meaning that all the configuration and personalization is coming from the Workspace platform and is not dependent of the device you are using. The desktop app is inheriting its UI from the web apps with the same navigation structure and visual alignment. Citrix also introduced Brand Personalization capabilities as part of Citrix Workspace for all environments. All easily and heavily customizable with your own corporate branding, similar to what Citrix did with Citrix StoreFront few years ago. When you customize the branding within the Workspace platform, thes changes are immediately applied to all 3 environments(web, mobile and desktop). Currently, only few options are available within Citrix Cloud to personalize Citrix Workspace. We can hope to have extended options available built-in inside the product in the future. Citrix Workspace app includes an HDX Engine (similar to Receiver) to allow you to start all your favorite virtual apps and desktops. It also has a Browser Engine to allow you to start your web and SaaS apps. There is also an integrated Files Plugin (previously ShareFile) to view your content. And to complete the experience, the app supports mobile. All your mobile apps are aggregated with your regular apps. It is important to repeat that Citrix Workspace App will have the same behavior as Receiver when connecting to regular virtual and desktop apps. It will only go in full Workspace mode when accessing Citrix Workspace. Citrix supports 50+ SaaS applications out-of-the box with Citrix Workspace and optionally managed with Citrix Cloud App Control to prevent data loss and improve productivity. These apps are aggregated like any other apps in the Workspace, and you can decide how they are accessed by your users. You can decide that security controls are not needed. Therefore the application will use the native browser with or without SSO, and no security control will be applied in that session. If your app needs to be in a secure container with security settings or analytics, you will enable App Control and it will open within Secure Browser or an embedded browser engine as part of Citrix Workspace app. DLP policies for SaaS will apply by App Control during the browsing to enforce company policies like watermarks, content filtering, restricted downloads or clipboard, etc. You may think that it is using the Secure Browser feature, but it is not. The Citrix Workspace-embedded browser is a native browser running on the client machine embedded in the Citrix Workspace security sandbox. Citrix developed a different framework available only for Windows and Mac at this time. The decision to use the embedded browser or the virtualized browser (Secure Browser) depends on the policies set by IT and the risk profile of the target application. Jeroen van Rotterdam published an excellent article explaining the differences between Secure Browser and Embedded Browser within Workspace. Citrix Workspace leverages Citrix ADC (previously NetScaler) to provide single sign-on across all applications whether in a datacenter, in a cloud, or delivered as SaaS. Citrix Workspace is providing additional value by allowing you to open contextual applications based on your data. For example, you have a PowerPoint .pptx file shared by your manager in your Workspace and you don’t have PowerPoint installed on your desktop. No problem! Citrix Workspace allows you to open this file directly into a provisioned Microsoft PowerPoint virtual app. Citrix Workspace also promotes content flexibility as it allows you to select which app you want to use to open the file. For example, you can pick between a Microsoft PowerPoint app installed on a XenApp server or use Microsoft PowerPoint 365 to open the previous .pptx document. Citrix Workspace also supports content from multiple repositories either managed by Citrix or via connectors. It means that Citrix gives you the choice on where you feel comfortable putting your data and without impacting your users. The same files are available via the web or desktop app and within the virtual desktops with the Citrix Files drive (previously ShareFile drive). Citrix Workspace will leverage existing ShareFile feature. For example, If no relevant application is available to open that file, it will load (if possible) with the default viewer part of the Citrix Workspace. For example, images can be viewed without any specific application associated to it. All ShareFile features are still here including Collaboration, versioning, Seamless protection of data, etc. All apps are now available in the same store. You don’t need to go to Secure Hub, Receiver or other websites for different types of apps. Virtual, Mobile, SaaS Apps and Desktops are now all available within the same Workspace and you don’t need extra clients to open mobile applications. Most customers are moving towards Microsoft Office 365. Citrix Workspace can aggregate all Office 365 apps. Universal Search is available in Citrix Workspace, allowing users to search through all types of applications within the Workspace including files owned or shared. Citrix Workspace has integrated XenMobile to support EMM including MDN, MAM and MCN. It allows users to enroll devices, install and launch mobile apps with Single Sign-On. 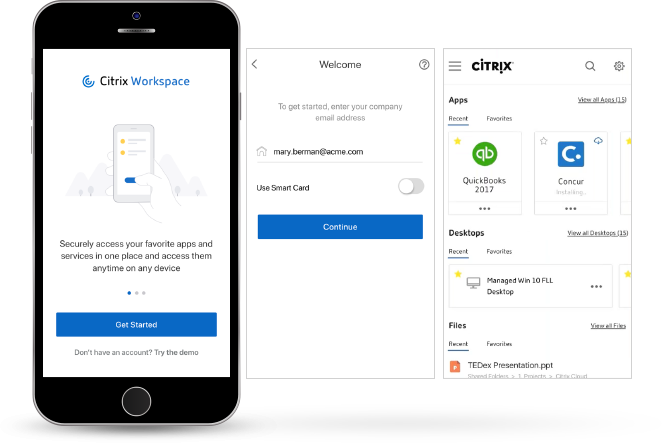 Citrix Workspace is context-aware and supports progressive disclosure, meaning that it will only display mobile apps within the mobile workspace and not within the web or desktop Workspace apps. For now, Citrix Secure Hub is still needed to install Mobile apps, but Citrix said that it is working to integrate that application into Citrix Workspace as well. Citrix invested a lot of time and money on Analytics since its announcement back at Synergy 2017. This year, the company has announced that it will be broadly available and that it will support the new Workspace solution. Instead of only adding restrictions to the Workspace, the emphasis will be to look for abnormal behaviors and insights across all products part of the workspace to identify abnormal patterns with the use of Artificial Intelligence and Machine Learning. The difficult task of aggregating and correlating data across users, devices, networks, apps and files is automated. As Citrix is telling all its customers to move toward Citrix Workspace, they are also investing a lot to monitor this unified workspace. The ServiceNow integration announced during Synergy 2018 is key for Enterprise customers who hope to achieve Workspace automation. The goal of any large organization is to have the ability for users to request for specific services that then initiates an approval workflow and automates the provisioning of these resources. Most of them(65%) are using ServiceNow or are planning to transition to the Cloud-based Service Management platform. This integration allows users to perform any of the 15+ out-of-the-box actions like request apps and desktops, reset frozen sessions and manage power actions by submitting self-service tickets. The ServiceNow plugin for Citrix Workspace will be available in the ServiceNow Store to install directly on the ServiceNow Instance with your Citrix Cloud proxy credentials. Citrix also offers 20+ API to build your own custom workflows and create time-limited provisioning allowing you to automatically unprovision apps and desktops if needed. Scheduled for Mid-2018, the integration of ServiceNow workflow automation with Citrix Workspace will reduce SLA for Apps and Desktop provisioning, ease daily management of your virtual infrastructure and speed up your onboarding/offboarding whether your Citrix controllers are on the Cloud or On-Premises. Citrix Workspace gives the ability to manage Desktop (XenDesktop), Apps (XenApp), SaaS apps and Files (ShareFile) environments from the same Citrix Cloud interface allowing for fast rollout. Citrix Director is still available and offers the same user experience as the on-premises version. You can also subscribe to Citrix Cloud Monitoring alerts available from status.cloud.com. Citrix Workspace is great accomplishment to bring all Citrix products together into one comprehensive solution and a step forward with transitioning the company to a service-based business. The latest updates make it a complete platform that only Citrix is capable to deliver to all customers, whether or not they are using Citrix products today. SaaS applications are one of the main focus in EUC right now, and Citrix Workspace allows your businesses to adopt any SaaS application. Citrix is helping organizations make the transition from traditional workplace to digital workspace with the right tool.